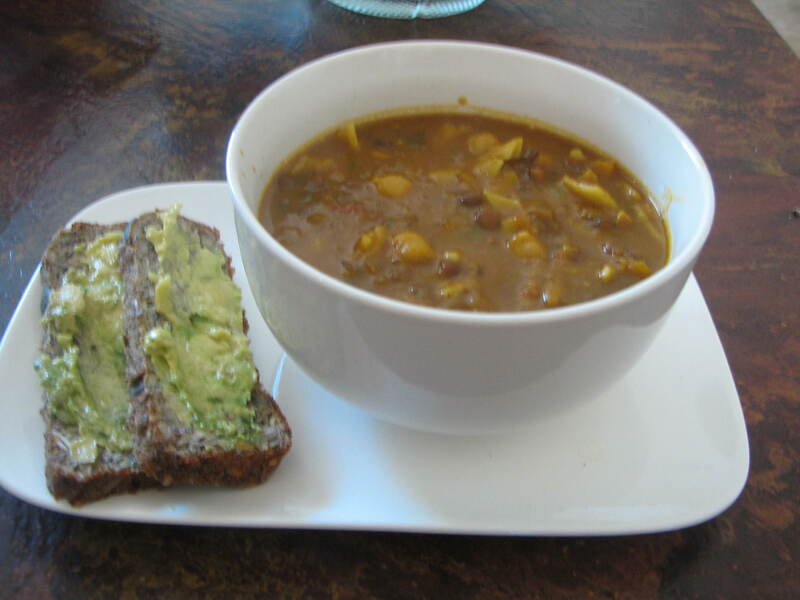 A few months ago I posted a recipe for Moroccon Lamb Soup, I have adapted this recipe for a vegetarian one. This has pumpkin, potato, spinach, lentils, chickpeas and is flavoured with turmeric, paprika and ginger. The results? Perfect! Chock full of nutrients, this can be eaten as a stoup (how I like it) or more water added for a more soupy texture. This made a large quantity to enable freezing of some but could easily be halved. Pour a little olive oil in the base of very large pan and saute onions, garlic and carrots with the spices gently till soft. Add all other ingredients except chickpeas and spinach and cook for 1 1/2 hours, keeping an eye on the water level as I needed to add more a couple of times. Add the chickpeas after 1 1/4 hours, check seasonings, and add the spinach just a couple of minutes before serving. This was actually very cheap to make, using most of the vegetables from the garden and frozen cooked chickpeas I by in bulk. The pumpkin base and spices makes this dish but this is something that could easily be adapted to use what is available/ cheap at the time. This is a simple and very delicious meal to make. 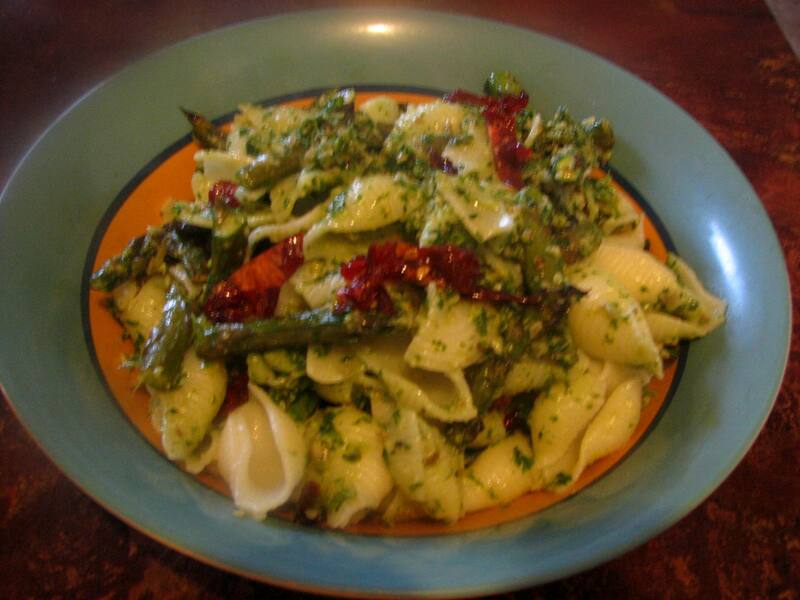 I used rice pasta, homemade pesto, homemade sundried tomatoes and homegrown asparagus. The pesto I used was my parsley and sunflower seed – the sunflower seeds make it an economical pesto (I sometimes use walnuts instead) The recipe for this is here, I make up batches and freeze in ice cube trays for use in recipes.https://quarteracrelifestyle.wordpress.com/2013/02/22/parsley-sunflower-pesto/ Despite the rather humble ingredients this is a really tasty pesto. The quantities for this dish are approximate, really it’s just a throw together meal depending on quantities available or required. Preheat the oven to 350 deg. Put the pasta on to cook in boiling, salted water. Pour a little olive oil into an ovenproof dish. Break asparagus into 3 pieces and roll in oil in dish. Roast in oven 12 minutes turning once. Drain the pasta and toss the sundried tomatoes and pesto through it. Add the asparagus and fold through gently. Tip into bowl and decorate with a few more slices of sundried tomato.